Ukrainian authorities who have long fought for a free trade zone with the European Union are now dissatisfied with the deal that was reached with Brussels in 2016, saying it is "out-of-date" and should be reconsidered. KIEV (Sputnik) — Ukraine's trade representative Nataliya Mykol’ska said Monday Kiev wants to revise the terms of the country's free trade agreement with the European Union as the existing sales quotas "do not work." "It is obvious that the conditions for free trade should be reconsidered. The talks on the creation of the free trade zone with the European Union have concluded long ago and at the moment the conditions of access to the markets of both the European Union and Ukraine are 'out-of-date," she said. The Ukrainian official added it was necessary to boost the EU-Ukraine trade ties and to find an optimal scenario of cooperation between Brussels and Kiev within the framework of the revised free trade zone or under the customs union. 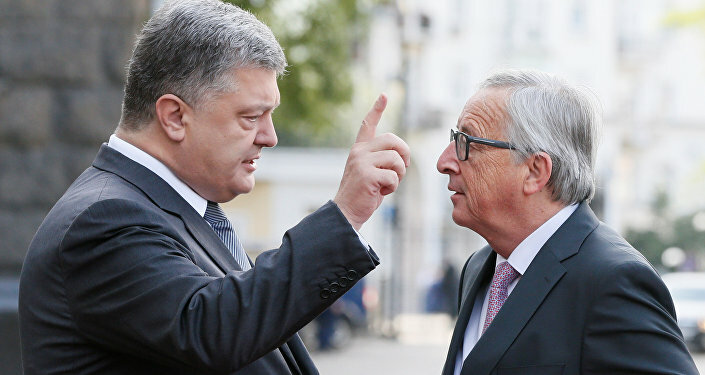 An EU-Ukraine arrangement on a free trade zone came into effect on January 1, 2016. At the same time, there is a set of EU quotas on 36 types of Ukrainian goods. Within the framework of these quotas, Ukrainian goods are delivered to the European Union under preferential terms and under common terms after these quotas are taken up. According to the Ukrainian Agribusiness Club (UCAB), the eastern European country has taken up the 2017 quotas for six groups of goods already after the first quarter of the year. According to the Ukrainian Ministry of Economic Development and Trade, the European Union is the main trading partner of Ukraine, with almost 40 percent of imports to Ukraine coming from the bloc.